Examples of map symbols used to show trees and forests on old Russian maps (1700s & 1800s) are documented in Izobrazhenie Lesa Na Kartakh by Liudmila Andreevna Shaposhnikova. The title is roughly translated to “How Forests are Depicted on Maps.” The book was published in Moskva, former USSR, in 1957. 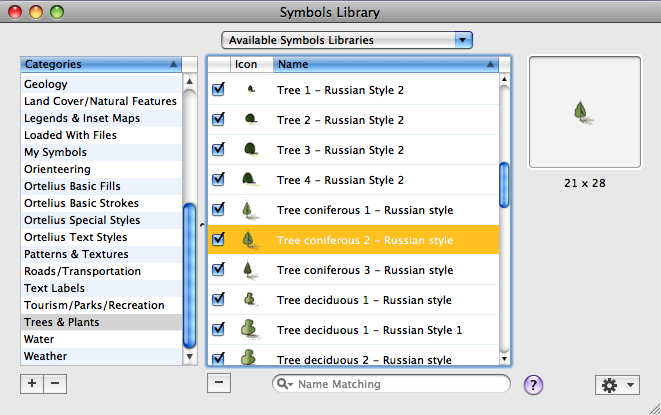 I really like the interesting mix of tree symbols with thematic underlays. I hadn’t noticed this approach before. It’s almost like building a legend into a thematic map. I want to explore this idea more! You finally helped me to solve my tree problem with making RPG maps. I’d been using the ZombieNirvana videos from YouTube as a guide, but I was never satisfied with the trees. Looking at these examples gave me the inspiration I needed. Here are the results – the map is for a player handout that I’m going to print on cotton paper and then “age”. Excellent blog! I must admit that I’ve never thought about DIY cartography but this blog is getting me interested. I love maps! very interesting blog…will follow with great interest! very glad to have stumbled on this post. THank you!